This last post in the series will deal with weathering the RBL boxcars and placing them in service on the railroad. Prior to weathering any car, I like to tone down the factory paint job and add a protective finish to prevent any damage to the graphics on the car. I sprayed the sides, ends and roof with a tiny bit of Floquil Grime added to a paint cup full of thinned Testor’s Dullcote. For this step I used a Paashe Model H airbrush and put a 50/50 mix of Dullcote and lacquer thinner in the paint cup. I then dipped the end of a paint brush into the bottle of Floquil Grime and stirred it into the paint cup. Doing this several times gave me a slightly tinted flat finish to apply to the car. The photo below shows the car once this flat finish has been applied and the ACI labels and tack boards added. This car was shopped in December of 1975 and I’m modeling August of 1976, so I applied light weathering to reflect a car that had been recently repainted. I started by mixing some artist’s tube acrylic burnt umber and ivory black with some Windex. The mix for this car was about 50/50 burnt umber to ivory black. I like to get a small batch mixed to the consistency of paint and then thin it slightly prior to applying it to the car. After applying the thinned mix, I took another brush, dipped it into the Windex and wiped it gently on a paper towel. I then began removing the wash with vertical strokes on the car sides, moving from top to bottom. Gently removing the wash in this manner will give you lightly faded and slightly grimed look on the side of the car. The photo below shows how the car sides appear at this point. For the ends, use the same steps as the sides but leave a little more of the wash towards the bottom. You can also take the brush used to remove the wash and dab it at the wash. This produces some of the blotches seen in the photo below. If you look closely at the photo above, you can see a couple of areas where the wash dried in a small pool. Dabbing these areas with the end of a cosmetic sponge before the wash dried would have improved the appearance and added a little more texture to the weathering. Another lesson learned. After the sides and ends were finished, I tackled the roof by making up a wash of burnt umber with a little bit of ivory black. I covered about half of the roof panels with this wash. Next, I went back across the panels with another brush that had been dipped in Windex and wiped on a paper towel. The idea is to get the look of a roof that has been exposed to the elements for a relatively short period of time. The photo below shows the finished roof. The last step in weathering the car was to apply a light dusting of AIM medium grey weathering powder to the truck side frames. The photo below shows the finished car. These two cars are now in service moving canned goods from the Libby Foods plant in Chicago to Mountain Food Distributors at Bass, WV on the Elkwater Branch. 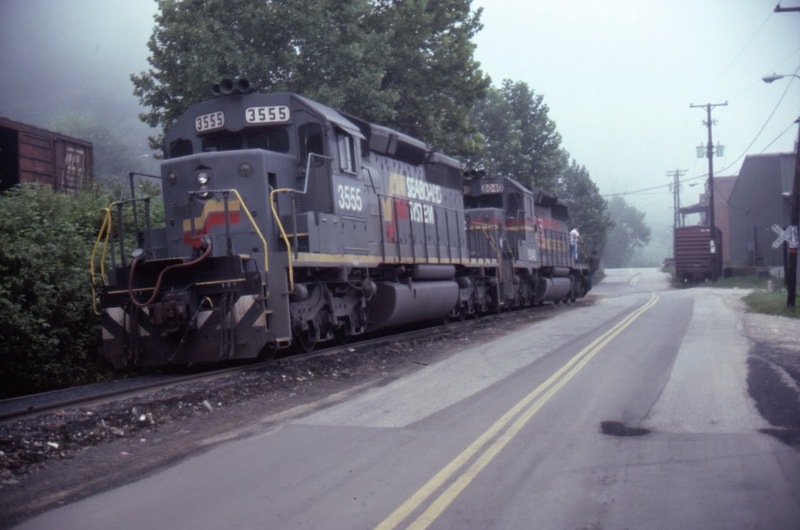 During a session, one car generally comes back empty into North Pierce on the Elkwater Branch Roustabout (AM) while the other. loaded car gets set out at North Pierce by an eastbound manifest. Later in the session, the first car will move west toward Chicago while the second car will move up the branch on the Elkwater Branch Roustabout (PM) and be delivered to its destination. The photo below shows one of cars headed up the branch on the Roustabout. At some point, another source of canned goods will be identified to the east and a new waybill will be made up. This will provide for the set-out of one of the cars at Big Chimney to picked up by an eastbound way freight. In the next session, the car will move west to Big Chimney to be picked up for delivery by the Elkwater Branch Roustabout (PM). It was Anthony Hardy sharing the “CUSTOMER IDENTIFICATION CODES for WORK ORDER REPORTING” for the EK Subdivision of the L&N that got this whole project started. In addition to having a couple of nice new freight cars on the layout, I now have a few additional industries to be served on the branches. So thanks, Anthony! In Part 2, we'll look at some modifications to the Atlas RBL boxcars that will make them more reliable in operation and a few missing details. The first step was to replace the truck screws by drilling #50 holes and tapping them to accept #2-56 screws. I wanted to make sure that there wasn’t a solid weight above the bolsters, so I removed the roof by gently inserting a knife blade under the edge as shown in the photo below. Neither roof was glued in place and both came off easily. I was surprised to find what is used for weights in these cars- two large nuts that are glued in place over the truck bolsters as shown in the photo below. With the roof removed, it was evident that nothing would interfere with drilling and tapping the truck bolster as described above. The Atlas car comes with Accumate couplers which are secured in the coupler box by a cover with a small pin cast into it. The pin fits into a round casting on the coupler box. I use Kadee #5’s or 58’s exclusively, so I needed to change the couplers. One of my freight car standards is to make sure that all couplers are secured in place with screws which insures that no couplers will break loose during an operating session. It also makes replacing them a cinch. To remove the couplers, I gently inserted a #11 Exacto knife blade under the coupler cover to pry it loose. The cut levers are glued to the cover but a gentle prod with a #11 knife blade will break them free. After removing the coupler, I marked the location of the pin on the other side of the coupler box cover. I put the coupler box cover back on the coupler box and used a #50 drill bit to drill a hole through the coupler box cover and the coupler box. After tapping the hole to accept a 2-56 screw, I placed the Kadee spring and coupler inside the coupler box and secured it with a small 2-56 screw.The photo below shows one of the coupler box covers removed and the new Kadee coupler installed. Once the couplers were installed, it was time to address the bright yellow color on the bottom of the car. While it may have been painted this way when the car was new, it wouldn’t take much time in regular service to acquire a solid coat of grime and dirt. To simulate this, I masked the sides and ends and sprayed the bottom with Rust-Oleaum camouflage brown. This paint comes in a spray can and is available at most home improvement stores. It dries perfectly flat, works well on plastic, and is a great dirty brown color that is perfect for the bottom of freight cars. The paint comes out of the can very heavy, so a few light passes are needed to get adequate coverage without building up too much paint. The photo below shows the bottom of the car after the paint has been applied. Note that some of the yellow still shows in a few areas. My goal was to make sure that everything visible from any normal viewing angle would be covered. In the event you wanted to cover every nook and cranny, you could decant a small amount of paint into a bottle from the spray can and use a small brush to hit those areas. For the base coat of weathering on the trucks, I sprayed them with the same Rust-Oleum camouflage paint that was used on the bottom. I like to spray the wheels and axles while they are mounted in the trucks as it prevents any paint from accumulating inside the journal boxes and keeps paint away from the end of the axles. You can see the super custom, extremely expensive, ultra high-tech painting jig that I made in the photo below. There were two fairly obvious detail omissions that needed to be corrected before weathering the car. This car comes with an early version of the consolidated stencil and a shop date of 12/75. Any car with these markings would have had an ACI (Automatic Car Identification) label which was mandated by the F.R.A in 1968 and was to be installed on all equipment by 1970. I used old Herald King ACI labels, which are no longer available, but you can get them from Highball Graphics. The second missing detail item is the tack boards on the side of the car. I had some in one of my parts boxes, so I mixed some yellow and orange paint to match the color of the car, painted the tack boards and then mounted them on the side to the right of the reporting marks. The photo below shows both of these details added to the side of the car. In Part 3, I'll describe the weathering techniques used to get this car ready for service. Anthony Hardy, a regular operator on the Chesapeake, Wheeling and Erie, recently came across some CSX material that had been given to friend by a gentleman who retired from the railroad. 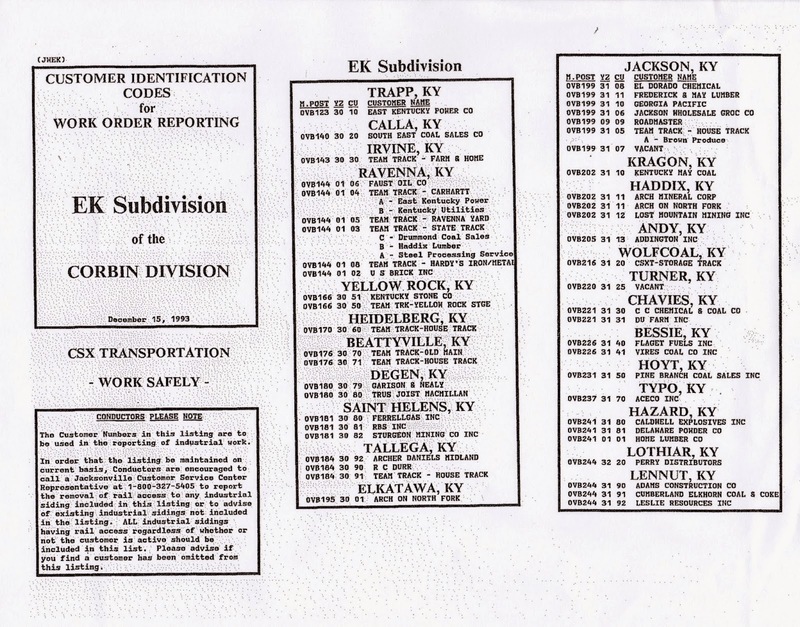 Included in the box was a customer listing for the EK Subdivision of the Louisville & Nashville Railroad. The photo below shows the document. This document started an e-mail exchange about the various customers, and in particular the Jackson Wholesale Grocery in Jackson, Kentucky. 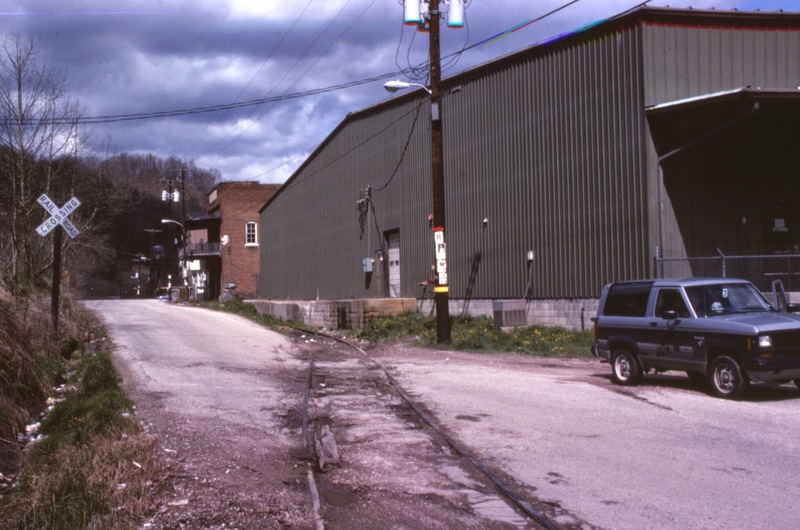 According to Anthony and several other friends, all of whom grew up in the area and have studied the operations of the L&N, it was common to see reefers and insulated boxcars spotted at grocery wholesalers throughout the coal fields up until the mid 1980’s. In fact, another one of the regular members of the CWE crew, Stuart Thayer, had actually taken some photos of a local working Jackson Wholesale back in 1985. Below are several of the photos that he passed along. Based upon this conversation, several of the branches on my layout now have grocery wholesale customers. All I needed was some cars for this service. At the same time this conversation was taking place, I came across an advertisement for an Atlas 50’ insulated plug door boxcar. This car is part of the company’s Master Series line and the detail is just fantastic. Everything about the car is extremely well done and there are many individually applied detail parts. Even the locking mechanism on the plug door is a separate part. It appeared these cars would fit the bill for the grocery wholesale service on the branches, so I picked up two of them lettered for RBNX. This car would work just fine right out of the box. But before I put any cars on the layout, I like to make sure that they meet certain standards that I have established for all of my rolling stock. I also make sure that they are weathered appropriately as I’ve noticed that once cars get on the layout, the likelihood that they will be pulled off for weathering decreases with each operating session. In Part 2, I'll make a few minor changes that will improve the performance and looks of these nice cars. John Miller's incredible Kanawha & Lake Erie layout is featured in Act 1 of the September edition of TrainMasters TV. Here's a link to the preview: http://trainmasters.tv/video-player/tmtv-2014-09-act-i-preview. You can also see more photos of Johns layout on the MRH forum by following this link: http://model-railroad-hobbyist.com/node/14081. And the next link will take you to photos on the forum of the large steel mill complex on the layout: http://model-railroad-hobbyist.com/node/14244. If you want to hear the story behind the K&LE and see some great video of the layout, check out the September edition of TrainMasters TV.